Hemi is here on loan from his Mom Lorraine Walker. 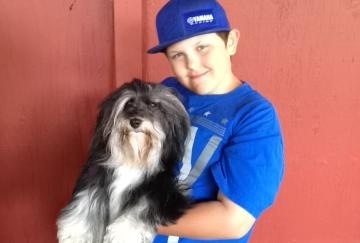 His FIRST weekend out to the Clackamas Kennel Club Show in Canby, OR he took a FIVE point Major handled by Debbi Foust under Judge Dr. Daniel W. Dowling. He has been a kind, gentle soul in our home, taking care of everyone, Especially our youngest son, snuggling and keeping watch over him when he was sick. Hemi is, obedient, happy, calm and loving. Quite a representation of the Breed. We are fortunate to be sharing him 'temporarily'!